A Cardassian vessel explodes as it leaves Deep Space Nine, and it appears that Federation terrorists are responsible. Why is there such a thing as Vulcan port? They don't seem like the drinking type. And, come to think of it, how can there be a Vulcan working for the Maquis? This reminds me of "The Wounded," a TNG episode that deals with a lot of the same issues and has Captain Picard working with a Cardassian played by Marc Alaimo (though not the same character) to uncover the mystery of Federation officers apparently trying to start a war with Cardassia. Incidentally, that was one of TNG's most O'Brien-centric episodes. I really want to see a picture of Sisko in lederhosen. The best scene is the one where Kira and Sisko have a shouting match over how to approach the situation. It really lays it all out and gives off some fireworks that work for both characters. I'll have more to say, I'm sure, when I watch the second part. 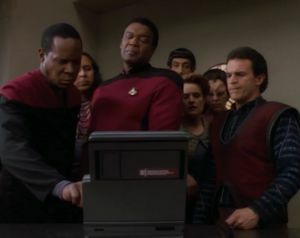 Introducing the Maquis is obviously continuing to lay the groundwork for VOY, though Michael Piller believes (as do I) that the Maquis background never pays off in that show, offering far more meat for DS9 to chew on.